I made a quick foray into the new (some phases still under construction) “Uptown” complex in Greater Victoria (BC, Canada) recently. 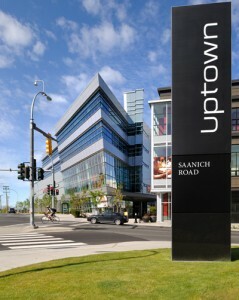 Uptown is what I call faux urbanism. It is a large monolithic structure – essentially a new generation retail complex with commercial and residential space on top. Its design cues mimic diverse urban environments. For example, storefronts each have their own facade and design, and stores face onto streets with sidewalks. Uptown, though, is not downtown in a number of key ways. First, it is a single large project. As such, it will never have the diversity of an urban zone where individual entrepreneurs are adapting and creating their own spaces. As it ages, it won’t regenerate and change with the times – aside from changes in which retailer occupies which space, it can not be redevelopment in pieces. Second, when you go to Uptown you are either “in” it or out. Unlike a funky downtown neighbourhood, it connects to nothing in the retail areas around it. While stores are built up to the street edge, most face inward to the faux streets inside the complex. It is also very difficult to find entry and exit points to the complex. It is clearly intended as a destination ‘all in one’ development just as more traditional malls are. 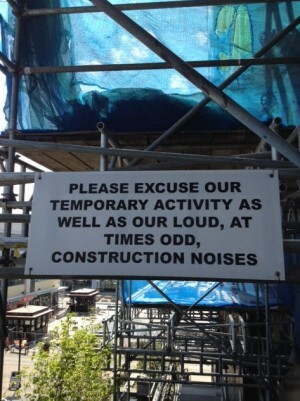 On a side note, I was pleased to see a small sign of personality amongst all this overplanned corporate retail – a tongue-in-cheek construction sign. Even that, however, is probably created by Uptown’s marketing firm – it certainly doesn’t look like the work of any construction contractor. So Uptown is to downtown as a Barbie doll is to a real woman. Some people will find it cute and fun. Not this writer. Mac D is a roving iPhone urbanist.